that had been escalating since Australia decommissioned the center on Oct. 31. Video footage from inside the camp on Thursday showed scenes of chaos. With asylum seekers screaming, immigration officials could be seen using long metal poles to rifle through the men’s belongings and push them from the camp where they have been living since they were first placed on Manus by Australia in 2013. On Friday, the police said 328 holdouts had been removed and sent to three alternative centers closer to the island’s main town of Lorengau. Many of the men said the centers lacked mattresses and, in some cases, water and electricity. Australia has refused to resettle any migrants who approach the country by boat, a policy intended to discourage dangerous ocean crossings and human smuggling. Since 2013, Australia has paid Papua New Guinea, its closest neighbor, to house hundreds of migrants caught at sea while trying to reach the continent. There are now 843 asylum seekers on Manus Island, all men, with a large contingent from Iran, but also from other countries in the Middle East, Africa and South Asia. Of those, 328 were still at the detention camp Friday, after 50 were forced to leave Thursday. Many of them have already had their asylum claims vetted and approved by the United States and are awaiting placement there, but American officials have not said how many will be accepted, or when. Nearly 200 have been rejected or have not completed the process. 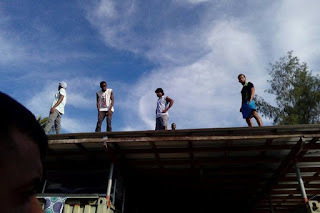 They are stuck on Manus indefinitely, in legal limbo. Tensions over the asylum seekers have grown since the governments of Australia and Papua New Guinea agreed in April to close the detention center by Oct. 31. Hundreds of the men refused to leave the camp, citing fears that they would be attacked or robbed by local residents, and complaining about unfinished housing. They also saw an opportunity to mount a protest that would bring attention to what they describe as four and a half years of torture by the Australian government. While the men in the shuttered camp found ways to survive on their own, with food and medicine smuggled in at night, officials in both countries have been warning that their refusal to leave would eventually be treated as trespassing. On Thursday, Papua New Guinea police and immigration officials raided the camp and insisted that everyone must go. Several asylum seekers reported that the authorities had damaged personal property, seized cellphones and intimidated the men who resisted. The visit Friday from the authorities completed the process. The Papua New Guinea police said all the men had been cleared from the camp without violence. Mr. Boochani said nonetheless that several men were injured over the past two days in the relocation, with a few ending up in the hospital. “It was completely by force,” he said. Many of the men were bused to the East Lorengau Transit Center, a facility with a capacity of less than 300 people, where some of the asylum seekers described scenes of frustration and chaos, prompting others to stay away and seek lodging elsewhere. The governments of Australia and Papua New Guinea each say the other is responsible for the men until a permanent solution can be found. Australia has pledged 250 million Australian dollars, or $193 million, for the men’s food and security at the centers in Lorengau for the next year. But disputes over contracts for caseworkers and security personnel have hampered the transition as many people on Manus — frustrated by the lack of a resolution — demand that more local employees be hired. Protests have broken out repeatedly over what is perceived as Australia’s unwillingness to take full responsibility for the men. On Friday, Australian officials insisted that the alternative facilities were adequate, despite the asylum seekers’ complaints. Prime Minister Malcolm Turnbull called for the men to accept the move. What will happen to the detainees? Many of the asylum seekers have repeatedly said they do not want to go to Australia anymore, nor do they want to stay in Papua New Guinea. Rather, they have asked to be resettled in a third country. United States officials said dozens if not hundreds of refugees from Manus and Nauru, the site of a second offshore center run by the Australians, would be accepted in the coming weeks and months. About 50 men already moved to the United States in September under a deal brokered by former President Barack Obama. Jacinda Ardern, the new prime minister of New Zealand, has also said she would an honor a predecessor’s pledge to accept 150 refugees. The Australian government has rejected that offer, fearing it would open a legal backdoor to Australia. No other resolutions have been proposed.